MANDALAY: Just three years after the reform process was initiated, the Myanmar commercial hub city of Yangon is hearing urgent appeals from conservationists to safeguard its historic heritage and prevent it from becoming “just another big Asian business city.” The call was heard a number of times in a talk by a representative of the Yangon Heritage Trust at the Mekong Tourism Forum with the added warning that the window of opportunity is closing rapidly. The first talk to be given at the MTF after the opening speeches, it reflected the dangers of the great Myanmar gold rush and the impact of “economic development” on natural and cultural heritage as well as the environment. It also reflected the inability of Asian policy-makers and development planners to learn from their own past mistakes, as well as those of others. 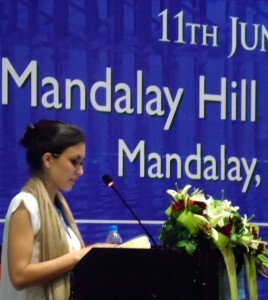 Ms Laetitia Millois, Researcher of the Yangon Heritage Trust, said that Yangon has the potential to be a great heritage city, thanks to one of largest collections of colonial era architecture in Southeast Asia, an extensive diversity of privately-owned and government buildings and residential areas dating back to pre-independence days. She noted that during the colonial era, Yangon was one of the most cosmopolitan, multi-cultural cities, thanks to immigration of different peoples and ethnic groups, with many mosques. churches, temples and a synagogue. The city also boasts many parks, beautiful lakes and a picturesque river with huge potential for scenic development. Ms Millois said Yangon has also witnessed many important historic events such as the Burmese wars, Japanese occupation and the independence struggle. Over the years, it has also been home to many important people such as Mahatma Gandhi, Jawaharlal Nehru and George Orwell, in addition to homegrown heroes such as U Thant, the third Secretary General of the United Nations. Today, she said, its cultural identity is disappearing fast. Many heritage buildings are being torn down, while others are in terrible condition due to lack of maintenance. The absence of building facade regulations means that advertising signboards of multinational corporations are spreading. She cited the example of one colonial heritage building which is totally covered by modern facade and an advertising signboard, almost as if its owners are ashamed of the original building. New uniform high-rise buildings are replacing old ones which is not in harmony with the street atmosphere. This is seriously damaging the urban landscape and contributing to an ugly patchwork. “We are not against modern construction but if we have more balanced development, it can make Yangon more vibrant,” she said. Traffic congestion has also emerged and roads are being widened by digging up pedestrian paths to make space for car-park slots. At the Mekong Tourism Forum in 2012, a similar warning was sounded loud and clear. Click here to read that report. She said that the average length of visitor stay in Yangon is two days but there is a lot of opportunity to grow this if the city can be made more walkable and lively. “There is a unique opportunity and very short window to act,” she said, citing a number of efforts under way to pass zoning and conservation laws. She said the Trust is working to get approval for a zoning law that would limit high-rise construction and create a multi-sector Yangon downtown conservation area with different heritage zones. It has also drafted a conservation law that would safeguard privately-owned buildings which have no legal protection. One potential pilot project is the Waziya cinema, one of the few heritage cinemas left in a city that once was full of cinemas halls. Gandhi Hall is another building that was nearly destroyed before the Trust managed to stop the demolition. The Trust is now working with the Indian embassy to preserve it. She said, “The worst part is that people are not encouraged to save the city. They don’t understand why they have to make it livable and walkable. The public perception is not so positive. We have to work hard to convince them that the buildings can be nice to preserve and live in.” She said they are talking to owners and tenants of a number of buildings and waiting for funds to help them conserve and upgrade their properties. The Trust is also working on a Yangon history exhibition which it hopes to have ready by September. Another move is to put in some lighting effects for some of the heritage buildings in downtown Yangon, create night markets and add more public spaces.